Any film that begins with a philosophy professor, played by Joaquin Phoenix, cruising in the bright sunlight musing to himself about Kant's "unanswerable" questions is going to charm me immediately (I also teach Kant). Indeed, Woody Allen's Irrational Man, which just premiered at Cannes, is a sunny joy to watch, despite its sinister subject: a philosopher named Abe who cannot find meaning in life - -until he commits a radical act. Perhaps -- I suspect -- it is the abundance of sun in each scene and the jazzy soundtrack by the Ramsay Lewis Trio that makes the film so jaunty. Woody Allen privileges outdoor shots, each in a pleasant upper-class locale in Newport, Rhode Island, where the professor has come to teach. Two lovely women become enamored of the professor: a college student, played by the beauteous Emma Stone with the bright calm hazel eyes, and a wiry attractive married chemistry professor, played by the quirky Parker Posey, who is herself unsatisfied with life and wants the elsewhere signified by Abe. But our charismatic existentially despondent professor cannot get it up, with either woman. In desultory fashion, he carries a flask of whiskey, philosophizes, and plays (a highlight in the film) at Russian Roulette. The film becomes amusingly strange with a typical Woody Allen moment: an overheard conversation at a local diner. It is this chance banal conversation -- this sidetrack from the main story -- that becomes the main story. Inspired by his eavesdropping, our spiritless professor makes a radical "choice", takes on a sense of responsibility and, for the first time, embraces manhood, in all its virile senses. The film is engagingly light in humorous conversation, and the acting of Joaquin Phoenix and Emma Stone enchantingly seductive, so much so that the curious choice that becomes the climax of this film takes on whimsical charm. And yet the choice the professor makes is one that crosses the limit of Good and Evil. Allen's erudition in the subject of Evil--from Dostoyevsky to Hannah Arendt--is (as per course) apparent in this film: we are to ponder about right and wrong. However, there is a twist. While the director's recent films end on a cynical, if not nihilistic, note, this film has a cheery resolution, and indeed, for the first time, seems to make a plea for "moral" meaning. Although, on reflection, I did come up with a second reading of the ending lines, that may very well lead back to cynicism, the more expected outcome of a Woody Allen film. The director, at the press conference, corrected me on my cynical reading. "No," he said. "This ending is a deep moment for the character. The character has grown through this experience, with this brush with --- . It is something that will make [the character] reflect in the years to come....."
He was so earnest in his conviction in "character growth" that I wondered if the director has been pulling our legs all these years when he argues for the meaninglessness of existence. However, he went on, with great passion, to expound on "meaninglessness": the pessimistic philosophy that, in his view, is at the heart of his film. "If you read the newspapers, you see that in every corner of the world, there are horrible things happening. You are living in a random universe. Everything you do is going to vanish, everything is going to be over, the sun is going to burst, everything that Beethoven and Mozart created will disappear." In this context, any meaning we give our lives is an act of delusion. "A majority of the people who survived the concentration camps did so because they believed in a false thing. The Communists were able to better cope with the stress because they were dedicated Communists, even if Communism eventually fell apart. Religion is another choice [of something to believe in]. The fact that it does not really work doesn't matter. It does make your life better if at least you believe in it." Shedding light on the title of his film, the director added that, in fact, anything we choose to believe in is irrational: whether it is to be a good person or to do evil. "People need something to believe in their lives. They have to choose if life is going to be meaningful or meaningless for them. They will choose an irrational life. Some people think that if they make sure to lead a good life they will go to heaven. That's no more crazy than the act my character Joaquin makes. The choice that he makes is irrational, but it is not any more irrational than any of the choices we all make in our lives." 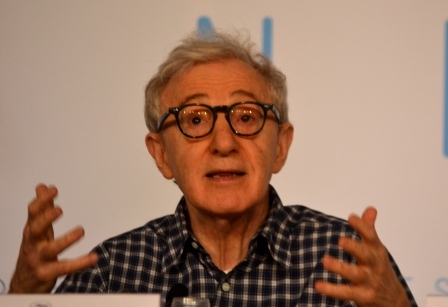 One might think that Woody Allen finds--at least---"meaning" in his phenomenal creativity and success as a filmmaker. Doesn't art put a stopper in the waste of time? No. The director responded that even his gifts are but a distraction from the reality of annihilation. "There is no positive answer to the grim realities of life. All of the great thinkers, from Freud to O'Neill, thought that too much reality is too much to bear. So I go into a movie house and watch Fred Astaire dance. Then I get out of the movie house and I am hit with the problem once more.."
The nearly 80 year-old director quipped: "For I will be old one day in the very distant future." I could not help feeling that despite that "very distant future" that awaits us all, and the eventual explosion of the sun, this pleasurable moment of distraction with Woody was, in the meantime, meaningful.